Children show incredible resilience this is one of the things that is so amazing about them, delighting their parents and teachers alike. But at the same time, it is important not to overlook the fact that childhood is a delicate, incredibly important time for development. As parents, you want to do as much as you can to protect them from experiencing harm, especially when that harm might produce damage that will last a lifetime. One area in which it is incredibly important to protect ones children is in the realm of hearing loss. These days, children are exposed to more loud noises than ever. They are often put in front of the television relatively unsupervised for hours at a time, by harried parents or absent-minded babysitters or frustrated housekeepers. Children now are getting their hands on music-playing devices like Mp3 players with super high volume. According to the American Academy of Audiology, every single year, more than 5 million American kids report hearing loss that is unrelated to genetic or natural causes. So, as a concerned parent, what can you do to help protect your children from short or long-term hearing loss? The first step you need to take is to be mindful of what kind of noises your kids are being exposed to. Make a mental checklist. Do they watch TV without you present? Do they have stereo systems or clock radios in their room? Do they have Mp3 players that they can use at their own discretion? Do they walk past a major construction site on their way to and from school every day? Once you have a mental list created of all of these potentially loud noises, you need to discuss with your children the possible consequences of being exposed to super loud noises. Sit them down and talk to them about the risks they might face regarding hearing loss if they were to damage their hearing now when they are young. Children often have trouble perceiving danger, so this is not the time to try to sugarcoat things. Be blunt about what the effects of long-term hearing loss are. Tell them that they would likely have to ear an uncomfortable hearing aid for the rest of their lives if they were to experience damage to their eardrums now. Once you have had a serious discussion with your children, you want to now focus on doing what you can to prevent the possibility that they will be exposed to potentially damaging noises. For example, some new televisions will allow you to set a maximum volume. For their music players, you can get headphones that only go up to a certain volume, or that block outside noises so that your kid will not have to turn up the volume to drown out traffic or television, etc., in the first place. And finally, when you hear your kids listening to something super loud, like the TV or radio, it is time to be vigilant and go turn it down. Sometimes that is what being a parent is, for better or for worse. Visit these miracle ear locations today. 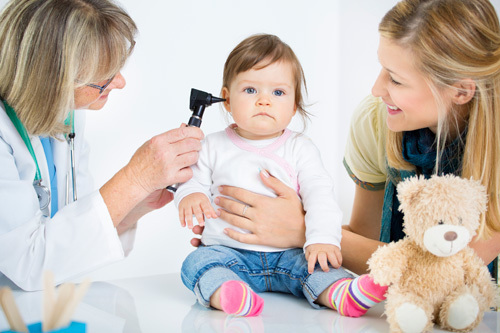 Get your kid a hearing test if you think they might be experiencing symptoms of being hard of hearing.